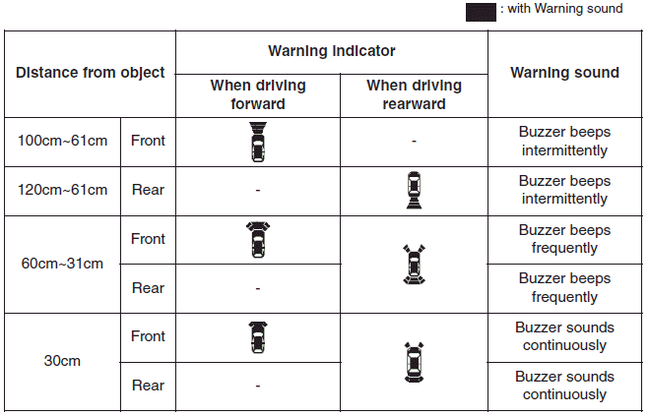 The actual warning sound and indicator may differ from the illustration according to objects or sensor status. Do not wash the vehicle's sensor with high pressure water. When driving rearward(at “R’ shift), Side sensor operates and if detecting some object at the side, warning indicator displays at front corner. This system can only sense objects within the range and location of the sensors; It can not detect objects in other areas where sensors are not installed. Also, small or slim objects, such as poles or objects located between sensors may not be detected by the sensors. Always visually check behind the vehicle when backing up.